A sensational bridal set, this pair of delightful diamond rings are set to make a sparkling statement. Crafted from 9ct yellow gold, a classic wedding band is embellished with elegant round cut diamonds for a classic and captivating appearance. 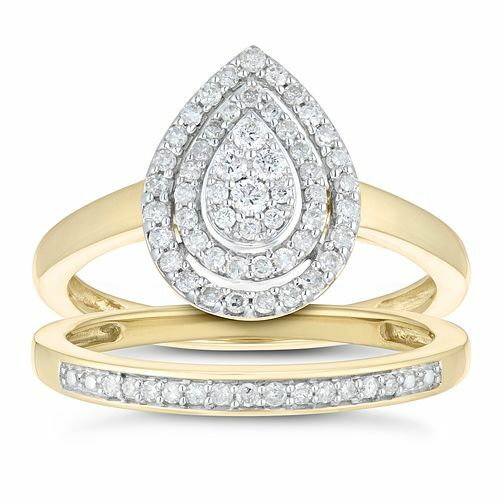 The elegant engagement ring is beautifully crafted from co-ordinating yellow gold, with a perfectly presented pear shape design, dazzling in diamonds with a 3-piece design. The diamonds in this set total 1/3ct, a sophisticated and shimmering pair of rings to encapsulate the bridal journey.